Body # 4, built for ? Body # 5, built for ? Body # 7, built for ? Body # 8, built for ? Body # 9, built for ? Body only, found on Singer chassis, originally on MG. Owned by Andrei Shinkarenko, QLD. 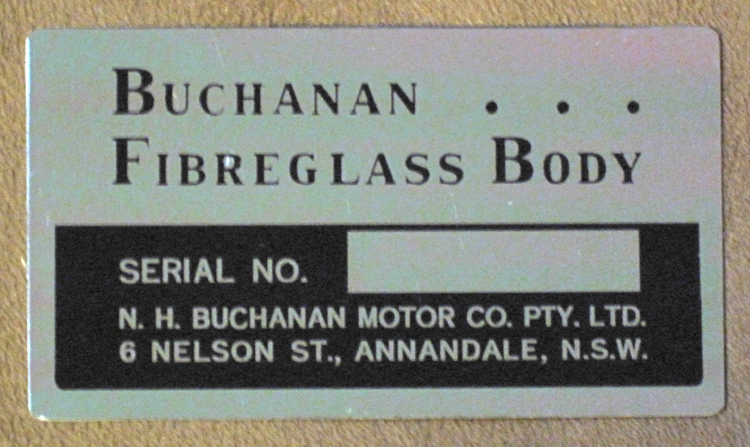 Amongst the large number of fiberglass bodies Nat Buchanan was churning out from his factory in Annandale (at a rate of 2 a week at one stage) he offered, to special order, a simplified version specially suited to sports-car racing. 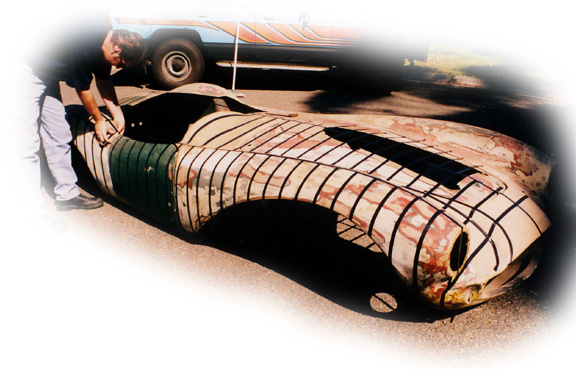 Weighing in at around 90 pounds with only one door of regulation size and minimum interior fittings it was designed for purpose built race cars. Additionally the bonnet was offered without a scoop for bodies fitted to a chassis where the engine was mounted lower than standard. The body was also available without the passenger side dash cowl and in place of an opening boot lid a drivers headrest was fitted. 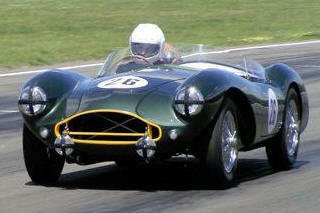 The first racer with all these features was the Gladiator, a MG powered Rizzo chassied car built up by Barry Taylor. Wal Anderson's Buchanan with replica Lotus 6 chassis featured a body with all the above features minus the headrest fairing as did Gordon Dummer's MG TC special. Jim Corcoran's Dorcas MG TC, the Jack Edward's HRG Holden "Godfrey Special" and the "RM Spyder" Buchanan Repco-Holden special built in 1958 by Horst Kwech sported these lightweight racing Buchanan bodies but with the hood scoops. Interestingly the works race cars all featured the standard fittings available on the production bodies. As production went along lightweight race seats, molded off those fitted to the Porsche Spyder, and a hardtop, to meet the regulations for closed racing cars in the GT class, became available. The consortium plan to make both fibreglass and aluminium bodies available. Replacement body panels may also become available for damaged cars. As of early 2010 bodies and parts are not yet available. Replica serial number plaques and a limited run of Buchanan Body badges based off the Buchanan Cobra badge are now available. Cost is AUD $ 30 for the serial number plaque and AUD $45 for the badge.